Above: String quartet in Performance Hall where concrete masonry units with multiple layers of paint behind acoustically transparent fabric reflect sound energy back into the space. 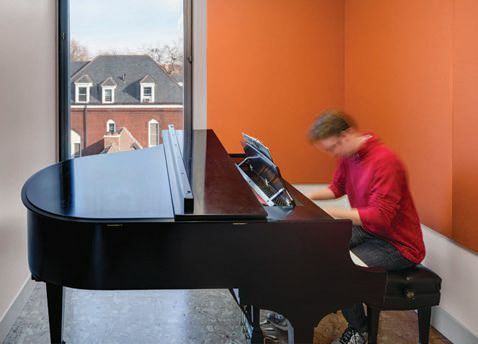 Practice facility where pianist can master skills while not being disturbed or disturbing other due to sound isolation provided by grout filled CMU inner walls. 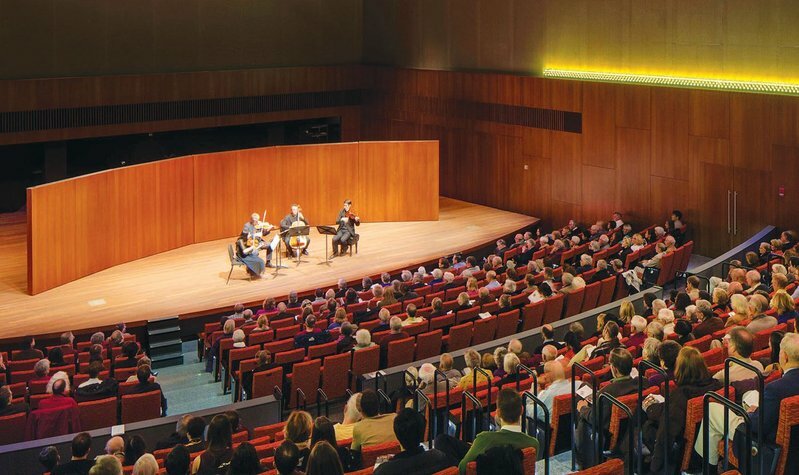 Since opening in 2012, the Reva and David Logan Center for the Arts at the University of Chicago has become a catalyst for creativity, using innovative design to foster interdisciplinary communication and artistic experimentation. Acoustic design relies heavily on cost effective concrete masonry units (CMU) to provide key sound isolation and characteristics necessary to enhance acoustics of both performance and practice spaces independently. In the 450-seat Performance Hall, groutfilled CMU has a positive impact on internal acoustics. CMU can be a soundreflective surface or a moderately sound-absorbing surface depending on how the face of the block is treated. The face of a CMU is very porous, like a sponge. When viewed under a microscope, the face looks like a series of canyons and caves. Air molecules vibrating inside these canyons lose energy, which absorbs sound. To make these surfaces less absorptive, multiple layers of sealant and paint were rolled on to fill in all the canyons and caves to create an airtight surface. Where split-face CMU is used, its craggy texture reflects high-frequency sound in random directions. This high-frequency diffusion can be helpful in controlling excess brightness where this scattering is desirable. Wall surfaces inside the Performance Hall are a mixture of wood paneling and acoustically-transparent fabric with CMU behind. The fabric is anywhere from a few inches to 8' in front of a sound-reflecting CMU wall; the CMU surface is considered, for acoustic purposes, the finish surface. Sealed CMU is very effective at reflecting sound at all frequencies, especially at low frequencies where gypsum board or wood paneling installed over an air space will give a little, absorbing acoustic energy. This low-frequency support is critical in a music venue where fullfrequency response allows the music to be rich and full. In the lower zone of the Performance Hall where the finish is wood panels, parging over CMU creates a flat surface to which the wood finish is glued without any air space. Wood panels and backup parged CMU act as one mass acoustically, creating a warm, bass-rich sound in the hall. Unlike a conventional education building where speech privacy is the most significant concern, isolation of high sound levels in the mid- and lowfrequency ranges produced by musical instruments and large sound reinforcement systems was required here. 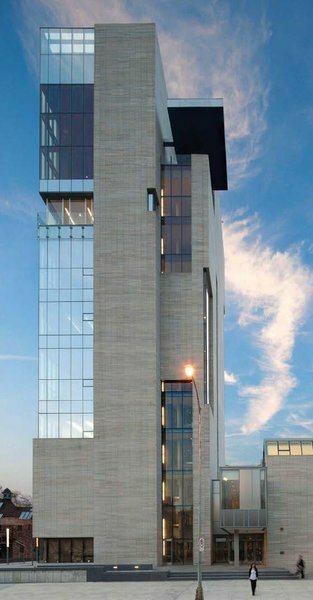 Missouri limestone fabricated into brick shape is a nod to both the limestone-clad historic Gothic buildings and the local Frank Lloyd Wright Robie House, while at the same time gives the 11-story Logan Center a sleek and distinctive contemporary appearance. Shown here is the 11-story tower. Normal conversation at 3' is approximately 60 decibels (dB) (expression of loudness) while loudness of sound system reinforcement or musical instruments such as a piano can easily reach 80 dB to 100 dB at 3'. Typical speech frequencies, from 500 Hertz (mid frequency) to 8000 Hertz (high frequency) have small wavelengths, ranging from approximately 2' to just a few inches in length. Low frequencies, from 63 Hertz to 250 Hertz, have much larger wavelengths, ranging from approximately 18' to 4' in length. Walls with heavy surface mass are required to control both the loudness and the low frequencies component. The heavier CMU wall is superior acoustically. CMU varying in thickness from 8" to 12", is used throughout the building, separating acoustically- sensitive spaces and reducing sound transmission between spaces. It was critical that CMU cells be filled with normal weight grout to ensure a consistently massive wall to reduce the transmission of sound at all audible frequencies. A 12" grouted CMU wall can provide 35-45 dB reduction at low frequencies, where a typical gypsum board office wall system can provide only 15-30 dB reduction, at these same frequencies. In certain locations, such as practice rooms, where especially high isolation is required between two directly adjacent rooms, the CMU wall is used as an inner core, with separate gypsum board walls constructed on both sides for even greater isolation. The facility is comprised of a two-story horizontal building and an 11-story tower clad in Missouri limestone fabricated into 4"x4"x36" brick reminiscent of Frank Lloyd Wright’s Robie House that is located on campus. The 11-story tower offers unparalleled views of the Chicago skyline and Lake Michigan, while the public spaces include ensemble rehearsal rooms, black- box and proscenium theaters, a performance auditorium, a gallery, a state-of-theart film screening venue, a café, and dynamic outdoor spaces. Teaching and presentation spaces for cinema and media studies, music, theater and performance, dance, and visual arts are interwoven throughout the facility.